Take exit 42/Route 57 north. 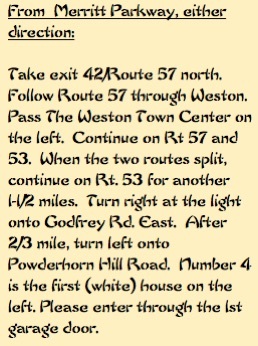 Follow Route 57 through Weston. Pass The Weston Town Center on the left. Continue on Rt 57 and 53. When the two routes split, continue on Rt. 53 for another 1-1/2 miles. Turn right at the light onto Godfrey Rd. East. After 2/3 mile, turn left onto Powderhorn Hill Road. Number 4 is the first (white) house on the left. Please enter through the 1st garage door. Go south on Rte 7. Turn left onto Rte 107 in Georgetown (just past Caraluzzi’s grocery). Turn right onto Rte. 57 South. 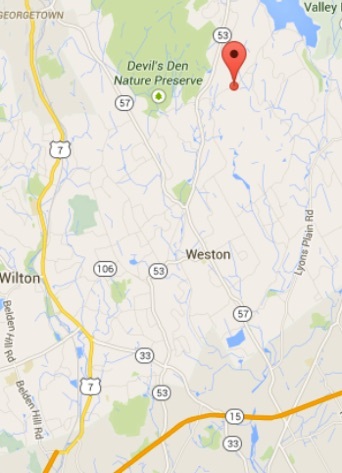 In approximately 2-3 miles, turn left onto Godfrey Rd West. Continue on Godfrey Rd West across the traffic light at Newtown Turnike (Rte 53) onto Godfrey Rd East. After 2/3 mile, turn left onto Powderhorn Hill Rd. Number 4 is the first (white) house on the left. Please enter through the first garage door.